Yearly favourites posts are never easy to write and as i'm really indecisive it's taken me a while to get these down to just a handful! Except for perfumes, 2014 has been a year of using more of my favourites rather than discovering new ones so these are all well used and well recommended by me! If I have time i'm going to write a separate post with a few non-beauty favourites as there's too much to mention in one post! 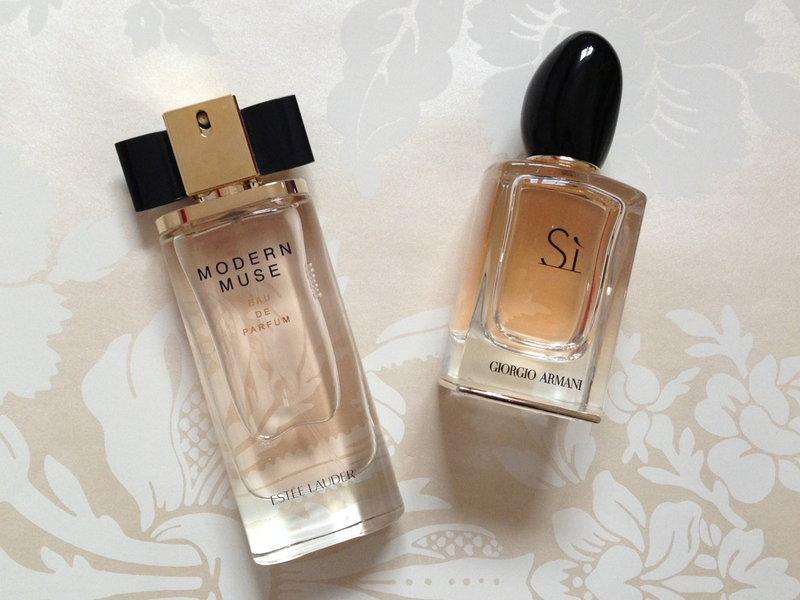 Estee Lauder - Modern Muse and Giorgio Armani - Si are my two favourite perfumes of this year without a doubt! Both were presents and I definitely can't decide which one I love the most! Si has an expensive feel, both with the gold edging of the bottle but also the scent which lasts a really long time and is one you don't forget. Modern Muse is more of a feminine perfume and has a floral scent which I love just as much. I'm useless at describing scents so if you're in Boots give these a go and you won't be disappointed. I'm writing this post at home and sadly forgot one of my all time favourites which is the Origins Clear Improvement charcoal mask. This is one of the only products i've ever tried where I notice a real difference every time I use it so I can't recommend it enough - you don't need to use lots so it lasts a good amount of time too. Another Origins favourite is the Modern Friction scrub which I like to use regularly to get rid of any dry skin. It's different to any scrub i've ever used as you add water to it to make more of a face wash which leaves your skin feeling super clean. The only thing I don't like is how much it hurts if you accidentally get it in your eyes! Although Origins products are on the more expensive side they're worth the investment in my opinion and i'm yet to read a negative review about any of them. 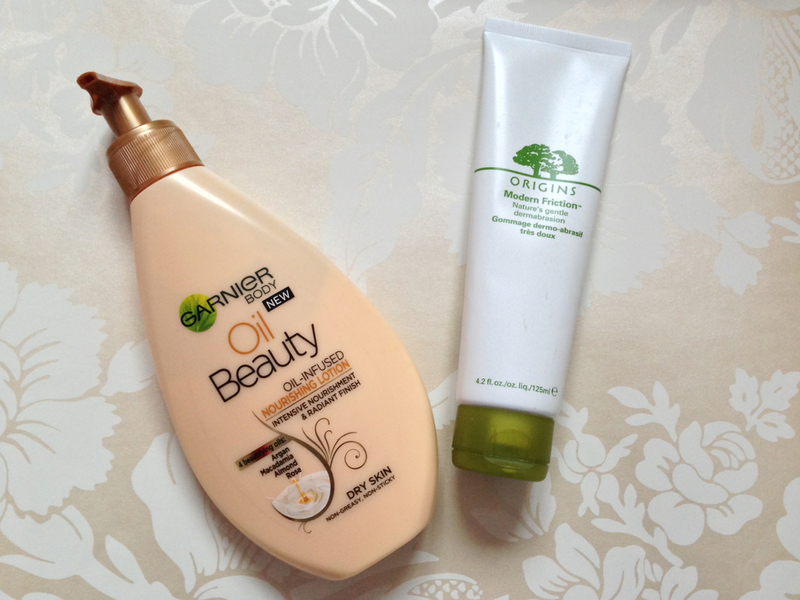 I don't normally like the little samples you get in magazines and rarely try them but the Garnier Oil Beauty moisturiser is an exception. It has a really unique scent and leaves my skin feeling soft without taking forever to sink in. It's also really affordable and the pump bottle means you don't end up wasting any too - i'll be repurchasing this when it eventually runs out. I think i've mentioned all these on my blog before but i'm one of those people who sticks to one thing once they like it and they're all part of my daily routine. I'm yet to find a mascara that compares to the Max Factor False Lash Effect as it makes my lashes look bigger and fuller without any clumps. It isn't the most affordable mascara so I usually stock up when I find a 3 for 2 offer although i've noticed that a lot of other mascaras are creeping up to the £10 mark too! 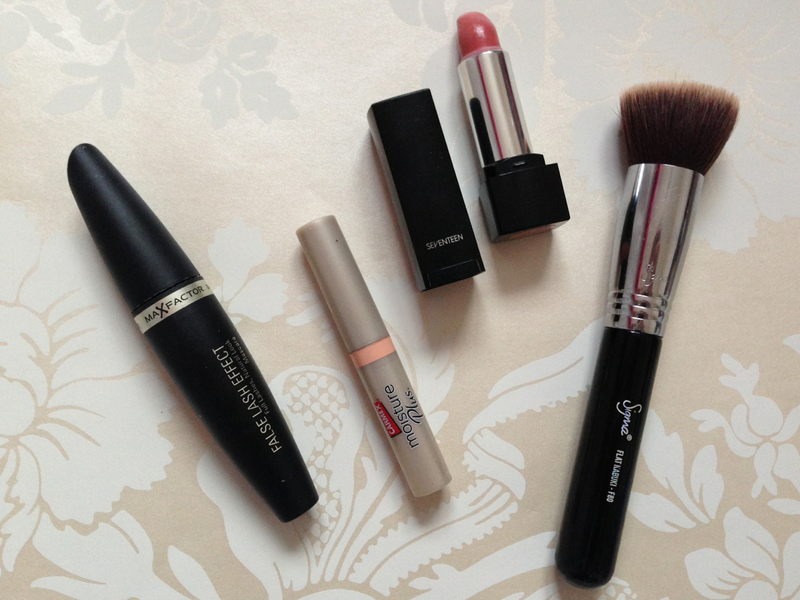 Carmex Moisture Plus in Peach and Seventeen Beehive are two lip products I use everyday. Both have been repurchased a few times and they both offer 'my lips but better' shades - perfect for people like me who are still a bit scared of a bright lip! I re-discovered my Sigma F80 brush this year after dabbling with the Real Techniques Stippling brush but finding that it made my foundation harder to blend. I find that the Sigma brush gives my foundation a much more airbrushed look and blends it really evenly, something you can't do by applying it with your fingers.